Have you ever tried to find a nursing top that doesn't show every spot of baby drool or spit up? I have found very few print nursing tops, some of them at Expressiva. 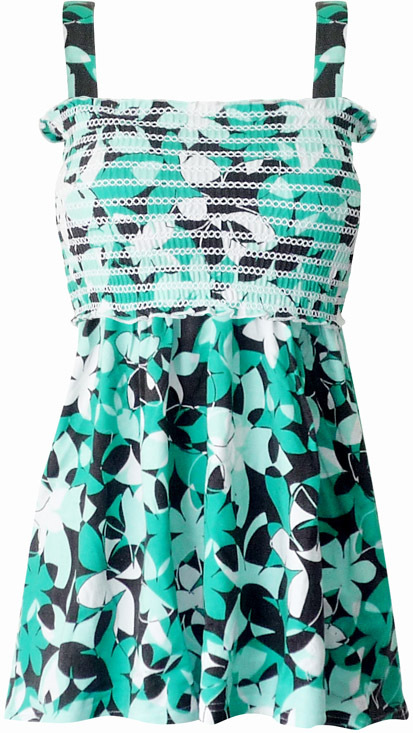 I was sent their Smocked Tube Top for review and I absolutely love the print and the fabulous fit. Now I can go through summer without visible infant spit up on my shirts in.every.single.photo! Honestly, when I'm home I could care less, but it seems like every time we visit people or get out of the house, the moment I put on a clean nursing tee - it's covered in drool and what not. Not cool, no matter how cute Baby T is. I know, I know, everyone is looking at him anyway, not me! This is a perfect nursing tank top for the hot months! It's so comfy, I find that a nursing bra is optional, especially if you're like me and don't need much support there. It is very flattering even with my mommy tummy six months postpartum. The print is the best part though, you won't see anything here! Let your baby drool all he wants! On my monitor the print looked more turquoise, when I received it I discovered it a little more greenish teal - which in no way made me like it any less. I also appreciate the wide straps that can hide bra straps and guess what? The strap length is adjustable, absolutely perfect if you're not 'average' but either super tall or short like me, I'm only 5'2". I find tank straps always falling off my shoulders, I'm glad I don't have to deal with that here. This smocked print nursing top retails for $45, but it is on sale for $34.99 right now. It is available in 4 sizes, I got the xsmall and I would say it fits true to size. I'm 100 lbs and it was a perfect fit, though I think a small wouldn't be as snug, it would probably have a longer fit, the length on the xs was perfect since I'm only 5'2". There are many other options at Expressiva, I love the nursing dresses they have - great for summer weddings and beach trips. One of you will win $30 to spend at Expressiva!